Boston St. Patrick’s Day parade: Sponsors flee homophobic parade. Spectators react to the Irish American Gay, Lesbian, and Bisexual Group of Boston during their appearance in the 1993 South Boston St. Patrick’s Day Parade. The organizers’ attitude doesn’t seem to have changed since then. Following weeks of back-and-forth negotiations, the organizers of Boston’s St. Patrick’s Day Parade have once again decided to prohibit LGBTQ groups from marching. As a result of the prolonged unpleasantness, several corporate sponsors have ended their support for the parade. But on March 3, officials from the Allied Veteran’s War Council, which organizes the event, claimed that statewide LGBTQ advocacy group MassEquality had lied about the number of veterans who would be marching with the gay group, and it withdrew permission. 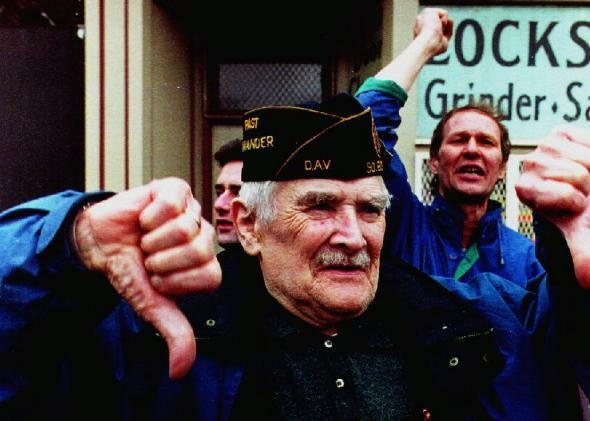 AWVC has repeatedly accused MassEquality of “using a ploy to enter this parade under false pretenses.” Essentially, it suggests that MassEquality manufactured the gay veterans group just so it could march. We write first and foremost, to reject allegations made by the Allied War Veterans Council that we do not exist. … We fought too long and too hard to be able to serve our country openly to retreat back into the closet in order to march in a parade. On Thursday, Mayor Walsh insisted that an agreement could be reached before Sunday’s parade. For the organizers, however, it may already be too late. Right now, its homepage is completely devoid of sponsors and peppered instead with vitriolic press releases. As it turns out, in 2014, most businesses don’t see much value in homophobia. Why Doesn’t Boston’s St. Patrick’s Day Parade Allow Gay Groups to March?